By definition, compensation can be understood as total amount of the monetary and non-monetary reimbursement provided to an individual in return for labour. Within this act of repayment, are three general varieties of compensation including direct, indirect and non-financial. Direct financial compensation is most widely known and recognized form of compensation. Most sought after by workers, direct compensation is the money which is paid directly to employees in exchange for their labor. This includes everything from hourly wages, to set salaries, bonuses, tips and commissions. Indirect financial compensation includes all monies paid out to an employee that are not included in direct compensation. This form of compensation is often understood as the portion of an employee’s contract that covers items such as temporary leaves of absence, benefits and retirement plans. 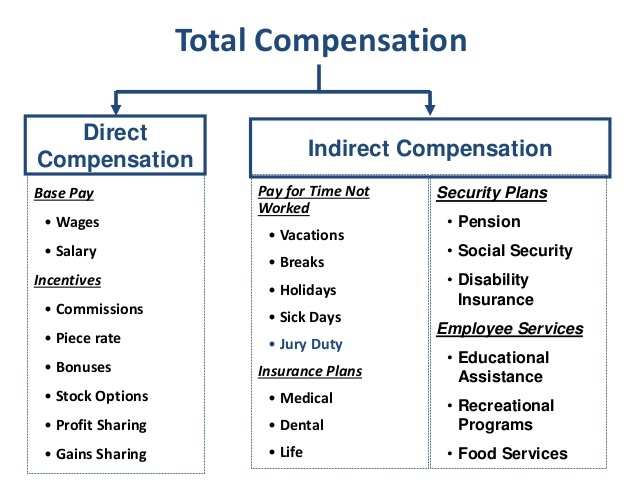 Non-monetary compensation differs from direct and indirect pay as it is has no monetary value. Non-financial incentives are the types of rewards that are not a part of an employee’s pay. Non-monetary incentives are typically effective for employees who are comfortable with their salaries or have been in the position for a long time. Compensation if this nature can include: Achievement awards, team leadership opportunities, personal days, prizes, paid training, gift cards, new office or workspace upgrade or even paid parking or transit passes.